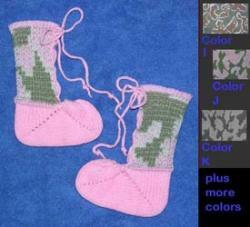 Your Special Baby Can Be Right In Style with this Camouflage Sock Bootie Shown in our Baby Pink Camouflage color way! 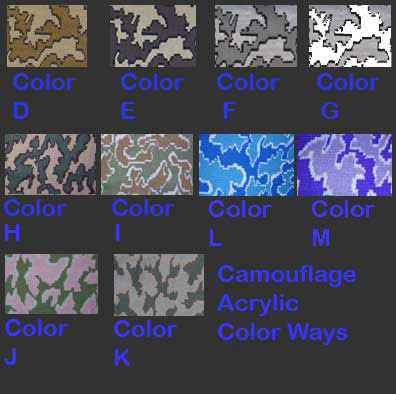 The 3 color jacquard fabric is shown in color way J. pink/ivory/light olive camouflage.design. Our camouflage isn't meant to 'hide' the baby, it will give him/her something unique to wear and stand out special! Check out our sweaters, caps, and blankets. Or better yet go to our Baby Sets where you can SAVE MONEY. Choose Color: Several color ways in our acrylic yarns are available for Baby too! If our inventory is low, allow 1 week for us to especially hand loom your size. These booties are individually made and not a 'mass production' item. We take pride that each item is made to our high quality standards. Submitted by Emailed in Review on Fri, 08/09/2013 - 20:55.